Finding a reliable home service can be a pain streaking task. It is an exercise that is often frustrating and characterised by lengthy waiting times, poor services, loss of property and sometimes exorbitant bills. 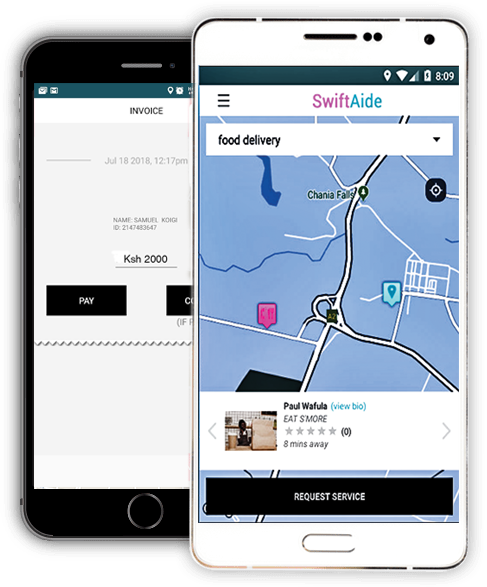 Faced with these challenges, a Kenyan start-up, Swift Aide is allowing consumers to find immediate help with everyday task, including cleaning, moving, deliveries and handy work, via its mobile marketplace. “I have always been fascinated by the immense potential that technology has in changing the lives of ordinary people,” George Karimi, Swift Aide founder notes. Swift Aide is a two-sided marketplace connecting ‘Clients,’ people who need help, with ‘Aides,’ a network of pre-approved and background checked individuals, who have the time and skills needed to complete listed tasks. “The platform has several categories and offerings from messengers, carpenters, food deliveries, drink deliveries, cooking gas deliveries, plumbers, electricians, mechanics, and nannies. We are tapping into opportunities that exist in the informal sector considering it controls 70 per cent of the job market in Kenya,” Karim says. “Kenya has a high unemployment rate and Swift Aide can be a lifeline to the unemployed population. This is the future of work,” says Karimi. The app is easy to navigate, service seekers submit their request through a form to Swift Aide. The app then takes those requests and links them up with matching providers from its database. Service providers are then required to submit quotations directly to the seekers. Once the seeker has chosen a service provider, further discussions are taken offline. Once the client goes to the app and can see the aides available for a particular service, Karimi says that they then initiates a service request. Once the request has been received they can either accept or reject. Upon accepting the Aide performs the task and can be paid cash or through the app which has a wallet linked to their Mpesa accounts. “The beauty is that the aides do not have to be online all the time as they will get an SMS notification when someone seeks their services. We were considering it would be a burden for them due to the data charges and the state of network connectivity in the region,” he points out. Aides are required to upload their identification documents and are thoroughly vetted by Swift aide team. This, the company believes deters anyone from using the app for illegal activities. Other documents aides submit include certificates, licenses, insurance and others depending on the service they provide. , the client is guaranteed that the person is qualified to perform the intended task. And lastly Freedom; the client is free to bargain with the aide and negotiate the best price for the job,” he says. Swift Aide follows up with all applicants manually to ensure the offers are legitimate, Seekers, on the other hand, must fill out a form describing their particular needs. Each type of service will get its own job. “For instance, to hire a photographer, the seeker needs to be able to clearly describe the type of service they are seeking,” Karimi says. To date, Swift Aide has registered 2000 aides on the app and about 5000 clients. The start-up now has a five member’s team and around 500 service provider in its platform. The clients, he says are mostly young professionals who have more money than time to outsource their daily chores. For maximum customer reach, Swift Aide has employed social media and influencer marketing to get the most reach to young people but we have also employed fliers and location based promotions to target audience on the ground. “All these strong networks have helped Swift Aide to kick start in the most powerful way possible,” he notes. The matchmaking platform also offers a referral programme where people earn some cash when they refer other people to sign up. Swift Aide charge service providers every time a service provider submits a quotation they pay a fee which ensures that service seekers only get serious offers. “Service providers are at a small risk, but the fees are easily paid off once a quotation turns into a job,” he says. Swift Aide doesn’t have any competitors in Kenya, though some classified sites, for example OLX also have a section for services. “Coming up with the capital wasn’t easy as we sourced from personal savings. We also had to look for a good programmer who would put all our ideas into a working and efficient program that is user friendly and this came at a cost,” Karimi points out. “Swift Aide has a bright future”, with e-commerce showing signs of promise in the country, Karimi estimates the service market in Kenya to be “in the billions,” pointing out their intentions for regional expansion. “We are planning to be fully entrenched in most major towns in the country in the next one year and expanding to the East African market in the next 5 years,” Karimi concludes.